This cartoon plays on the fear that Whites had towards African Americans. As pictured, free African Americans are dancing with white women, replacing the white male populace. Targeted at Southerners, many feared the abolition of slavery and its unwanted effects. This cartoon shows an exaggerate effect of African Americans on whites if freed from slavery. 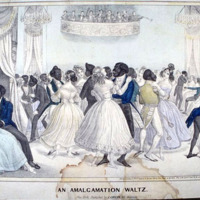 Edward W. Clay, "An Amalgamation Waltz"
Unknown, Edward W. Clay, "An Amalgamation Waltz", n.d, Civil War Era NC, accessed April 24, 2019, https://cwnc.omeka.chass.ncsu.edu/items/show/716.